What Nancy Pelosi, Steny Hoyer and Fred Hiatt mean by "bipartisanship"
Even the GOP, the media establishment and many Democrats themselves are openly mocking the claims by Pelosi and Hoyer that they "negotiated" a "bipartisan compromise." "When they saw that we were unified in sending that bill rather than falling for their scare tactics, I think it sent them a message," said House Speaker Nancy Pelosi (D-Calif.). "So our leverage was increased because of our Democratic unity in both cases." Not even the media establishment and the GOP can refrain from mocking this pretense they're trying to peddle. What's amazing is that they're actually as devoid of dignity as they are integrity. As I noted yesterday, the GOP couldn't even wait for the ink to dry on this "compromise" before publicly -- and accurately -- boasting that they not only got everything they want, but got even more than they dreamed they would get. To The New York Times' Eric Lichtblau, GOP House Whip Roy Blunt derided the telecom amnesty provision as nothing more than a "formality" which would inevitably lead to the immediate and automatic dismissal of all lawsuits against the telecoms, while Sen. Kit Bond taunted the Democrats for giving away even more than they had to in order to get a deal: "I think the White House got a better deal than they even had hoped to get." Lichtblau himself noted that "the White House immediately endorsed the proposal" and wrote that the bill "represents a major victory for the White House after months of dispute." Reporters Dan Eggen and Paul Kane were even more blunt and derisive in The Washington Post, noting that the Democrats "hand[ed] President Bush one of the last major legislative victories he is likely to achieve"; that "the deal appears to give Bush and his aides, including Attorney General Michael B. Mukasey and Director of National Intelligence Mike McConnell, much of what they sought in a new surveillance law"; and that "the negotiations underscored the political calculation made by many Democrats who were fearful that Republicans would cast them as soft on terrorism during an election year." Surrendering and fearful: that's the face of the Democratic Party. It's how they show they're not weak. The most succinct summary of what the Democrats just "negotiated" came from Russ Feingold: "The proposed FISA deal is not a compromise; it is a capitulation." Numerous other Democratic office-holders and Congressional candidates scornfully characterized this bill for what it is, including Andrea Miller, a Democratic nominee for Congress in Virginia, who said: "We have a Democratic majority in the House and yet they seem to be as confused by the meaning of the Constitution as the Republicans." (And as the vocally pro-Obama Nation notes, the Democratic presidential candidate -- who had been so outspoken against telecom amnesty and warrantless eavesdropping in the past -- is still deafeningly silent, even as the House prepares to vote later today). CONGRESSIONAL leaders of both parties should be commended for drafting legislation that brings the country's surveillance laws into the 21st century . . . It also provides some welcome evidence that congressional leaders remain capable of achieving delicate compromise in the national interest. But this absurd praise underscores what the Washington power structure means when they speak of "bipartisanship" -- it means having the Republican Party demand something, and then having enough Democrats agree to it to ensure it passes in essentially undiluted form. But more importantly, "bipartisanship" is already rampant in Washington, not rare. And, in almost every significant case, what "bipartisanship" means in Washington is that enough Democrats join with all of the Republicans to endorse and enact into law Republican policies, with which most Democratic voters disagree. That's how so-called "bipartisanship" manifests in almost every case. . . .
On virtually every major controversial issue -- particularly, though not only, ones involving national security and terrorism -- the Republicans (including their vaunted mythical moderates and mavericks) vote in almost complete lockstep in favor of the President, the Democratic caucus splits, and the Republicans then get their way on every issue thanks to "bipartisan" support. That's what "bipartisanship" in Washington means. That's exactly what is going to happen with this latest FISA "compromise." Republicans will be virtually unanimous in their support of it, while the Democratic caucus will split and enough of them will join with their Republican colleagues to make sure it passes. "Bipartisan compromise" means that Democrats comply with GOP demands. While huge numbers of civil liberties advocates, Democrats and prominent libertarians are furious and disgusted by this bill, is there even a single hard-core, right-wing Bush supporter remotely unhappy with it? No. Because it gives them everything that that faction ever wanted -- actually, as Kit Bond said, more than they ever dreamed of getting. But in Washington World, that is a grand "bipartisan compromise," by definition: when the President's demands are complied with. In the course of criticizing the "compromise" bill, Andrew Sullivan wrote yesterday that he's "not as livid as" I am because "at least the White House appears to have conceded that the Congress has the final say on what is and what is not legal in eavesdropping." But that's actually not true, and that really underscores the key point here. At the meeting [with the DOJ], Bruce Fein, a Justice Department lawyer in the Reagan administration, along with other critics of the legislation, pressed Justice Department officials repeatedly for an assurance that the administration considered itself bound by the restrictions imposed by Congress. The Justice Department, led by Ken Wainstein, the assistant attorney general for national security, refused to do so, according to three participants in the meeting. That stance angered Mr. Fein and others. It sent the message, Mr. Fein said in an interview, that the new legislation, though it is already broadly worded, "is just advisory. The president can still do whatever he wants to do. They have not changed their position that the president's Article II powers trump any ability by Congress to regulate the collection of foreign intelligence. This scandal began by revelations that the President broke the law -- committed felonies -- when spying on our calls and emails without warrants, because he believes he has the power to break the law. The scandal all but concluded yesterday, with the Democratic Congress (a) protecting the President, (b) permanently blocking the lawsuits which would have revealed what he did and would have ruled that he broke the law, and (c) legalizing the very illegal spying regime that he secretly ordered in 2001. Only in the twisted world of Washington can that be described as a "compromise." 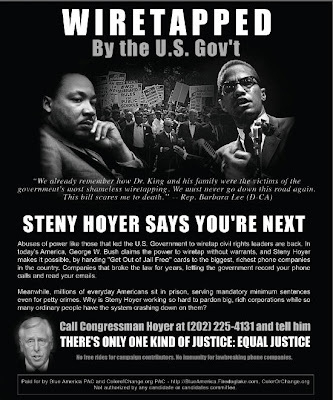 Our first ad, featuring Steny Hoyer, is almost finished and will run as a full-page ad in The Washington Post and in numerous newspapers in his district, aimed at his core Democratic base. 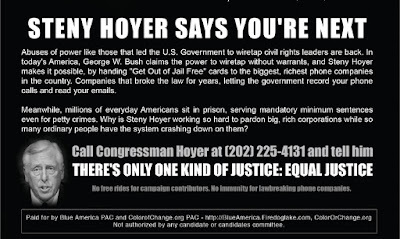 We are excited that Color of Change -- the online, grass-roots African-American organization devoted to demanding more responsiveness from Washington officials -- has now joined our coalition and is directly working with us on this ad campaign against Hoyer. And we hope to expand our work with them to include the other campaigns we are doing, including -- just for now -- the ones against Rep. Chris Carney and Rep. John Barrow. The total amount we have for this campaign is now almost $250,000. The response has been overwhelming. I know that many of you have donated as much or even more than you could, but the more we raise, the more of an impact we can make against the individuals responsible for this travesty. Making them know there is a real price to pay when they do this -- not by getting deluged with angry phone calls or merely having primary challenges, but doing everything possible to expose their real character, remove them office and put a permanent end to their political careers -- is the only real way to deter its repetition. Contributions can be made here. The Democratic Congress is more popular with Republicans than with Democrats. And that doesn't even include yesterday's events, so I'm sure the Democratic Congress will become even more popular among Republicans. And can you blame Republicans? If I were a hard-core Bush follower -- such as him or him, praising the "compromise" bill -- I would have a huge poster of Steny Hoyer or Rahm Emanuel on my wall. Unconditional, endless funding of the war. Warrantless eavesdropping. A stop to lawsuits examining Bush lawbreaking. Telecom immunity. What more could a Bush follower ask for? As Kit Bond put it: "the White House got a better deal than they even had hoped to get" -- a deal they tried but were unable to get when the Congress was controlled by Bill Frist and Denny Hastert. One thing is beyond dispute at this point: the White House's plan to resolve the NSA scandal by obtaining amnesty for past lawbreaking and future legislative blessing for its warrantless eavesdropping program has veered far off course and, at least for now, appears genuinely imperiled. The White House had to wait until Harry Reid and Nancy Pelosi took over before they could get that done. For a right-wing Bush supporter, what's not to love? He forgot to say that we should click our heels and salute before obeying, but that omission notwithstanding, Bond has brilliantly put his finger perfectly on the bipartisan ethos of our ruling class. Pardon me, but I just need to write that again: "When the Government tells you to do something, I think you all recognize, uh, that that is something that you need to do." Clearly, Steny Hoyer, Rahm Emanuel, Nancy Pelosi and we-will-see-today- how-many-other-Democrats concur. "I'm not here to say that the government is always right, but when the government tells you to do something, I'm sure you would all agree that I think you all recognize that is something you need to do," Bond said. Even when the Government is wrong, even when it orders you to do something illegal, your role is not to question but to obey. That's what he is saying explicitly. When Democrats took over the Congress, they issued a document vowing to "end the 'dead of night' special interest provisions that turn bills into special-interest giveaways" and proclaimed: "Lawmakers must have the opportunity to read every bill before they vote on it. It’s common sense." Today, the House leadership has set aside a grand total of one hour to debate the FISA/amnesty bill, and gave its members less than 24 hours from the time it was released yesterday until they have to vote on it today. That's the same bill which the NYT this morning calls "the most significant revision of surveillance law in 30 years." They're going to enact massive changes to our spying laws without having the slightest idea what they're voting on. All they know is that the President demanded this, and that's enough, because -- as Kit Bond says -- "when the government tells you to do something, I'm sure you would all agree that I think you all recognize that is something you need to do." In this formulation, "the government" means "The President." UPDATE IV: With less than 24 hours to read -- let alone understand -- what they were voting on, the Democratic-controlled House just passed the "compromise" FISA/telecom amnesty bill by a vote of 293-129. I'll post the link to the roll call when it is available. As always, Republicans supported the bill virtually in lockstep, while Democrats split (105-128). Barack Obama managed not to express a view one way or the other prior to the vote (and still hasn't). Nancy Pelosi spoke in favor of the bill, so the whole top layer of House Democratic leadership supported the bill. UPDATE V: The roll call vote is here. Of the Republicans: 188 voted YES, and a grand total of 1 -- a single lone soul (Rep. Tim Johnson of Illinois) -- voted NO (Ron Paul wasn't present). For the Democrats: 105 voted YES and 128 voted NO. The Democrats voting YES included all of our current targets -- Hoyer, Barrow and Carney -- as well as Pelosi, Hoyer, Emanuel and House Intelligence Committee Chairman Silvestre Reyes. Voting NO -- to their credit -- were Democratic Senate candidates Rep. Tom Allen (Maine) and Rep. Tom Udall (New Mexico). "This bill scares me to death and I urge a no-vote," said Rep. Barbara Lee (D-CA), co-chair of the House's Progressive Caucus. She compared the bill to the era of former FBI head J. Edgar Hoover. 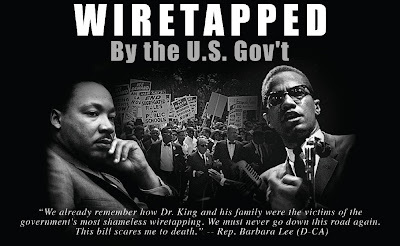 "We already remember how Dr. [Martin Luther] King and his family were the victims of the government's most shameless wiretapping. We must never go down this road again." That's exactly the road on which the Democratic leadership in Congress just put the country once again, and that also happens to be the theme of our first set of ads against Hoyer and Barrow, to be unveiled very shortly. The ad -- which was designed by The Seminal -- can be seen in its larger version by clicking on it above. I don't want to reveal too many details about our strategy against Hoyer, Carney and Barrow, because -- especially in the case of the latter two, who have difficult elections coming up (Barrow's primary is on July 15) -- I don't want them to be able to anticipate and plan for what we're doing. But the bulk of the funds we have raised and are continuing to raise will be devoted -- with ad campaigns and other programs -- against Carney and Barrow, both of whom are extremely vulnerable. But Hoyer was the prime catalyst for what just happened and it is vital that his constituents know what he did. He almost had a very credible primary challenge this year and I'd be very surprised if he did not have one in the next cycle. It is vital to begin separating him now from the constituents whose interests he ignores and tramples upon. Placing this as a full-page ad in The Washington Post (at an extremely discounted rate) is also the ideal way to announce the beginning of this campaign to all of them -- the whole Beltway -- so they have just a small taste of what it entails. The next stage against Hoyer -- which will result in communications directly to huge numbers of his constituents -- will be unveiled very shortly, as will the first phase against Barrow and the next steps of the ongoing campaign aimed at Carney. We are also organizing a campaign to generate calls to key swing Senators, who will vote on this bill this upcoming week, but we will not devote any funds to that. All monies raised will be directed at the vulnerable individuals who are responsible for what happened today. Contributions to increase the potency of this campaign can be made here. Given the grave threats that we face, our national security agencies must have the capability to gather intelligence and track down terrorists before they strike, while respecting the rule of law and the privacy and civil liberties of the American people. . . .
After months of negotiation, the House today passed a compromise that, while far from perfect, is a marked improvement over last year's Protect America Act. . . It does, however, grant retroactive immunity, and I will work in the Senate to remove this provision so that we can seek full accountability for past offenses. It is not all that I would want. But given the legitimate threats we face, providing effective intelligence collection tools with appropriate safeguards is too important to delay. So I support the compromise, but do so with a firm pledge that as President, I will carefully monitor the program, review the report by the Inspectors General, and work with the Congress to take any additional steps I deem necessary to protect the lives -– and the liberty –- of the American people. UPDATE VIII: Nobody should be fooled by Obama's vow to work to remove telecom amnesty from this bill. Harry Reid is already acknowledging that this "effort" is likely to fail and is just pure political theater: Reid said: "Probably we can't take that out of the bill, but I'm going to try." The article continued: "Reid said the vote would allow those opposed to the liability protection to 'express their views.'" We should continue to demand that amnesty is removed from the bill -- and fight it to the bitter end -- but this whole separate vote they'll have in the Senate on whether to remove amnesty is principally designed to enable Obama, once he votes to enact this bill, to say: "Well, I tried to get immunity out, and when I couldn't, I decided to support the compromise." It's almost certainly the case that Hoyer secured Obama's support for the bill before unveiling it. Either way, Obama -- if amnesty isn't removed -- is going to vote for warrantless eavesdropping and telecom amnesty, and his statement today all but sealed the fate of this bill. There is no point in sugarcoating that, though we ought to continue to fight its enactment with a focus on removing amnesty in the Senate. Greg Sargent makes several good points about Obama's statement. UPDATE IX: I'll be on Rachel Maddow's show tonight at 7:15 p.m. EST to discuss all these matters. Live audio feed and local listings are here.